Back in 2013/2014, I used to post regular drawing guides on here (like this one ) which explained how to draw specific things. Although I abandoned this project due to the sheer exhaustion of producing too many daily updates, one other reason why I abandoned it was because I felt that hyper-specific drawing guides weren’t that useful to people learning how to make art. Yes, there’s a place for guides that teach you how to draw hyper-specific things but a major part of learning to be an artist is learning how to draw anything. 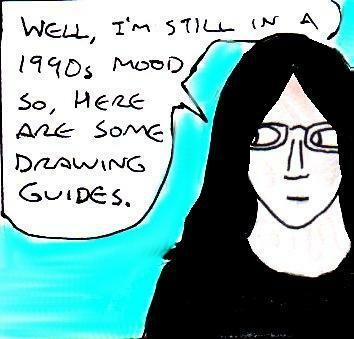 Especially when there isn’t a pre-made drawing guide to tell you how to do it. Thankfully, this isn’t as difficult as it sounds – although it does require practice! 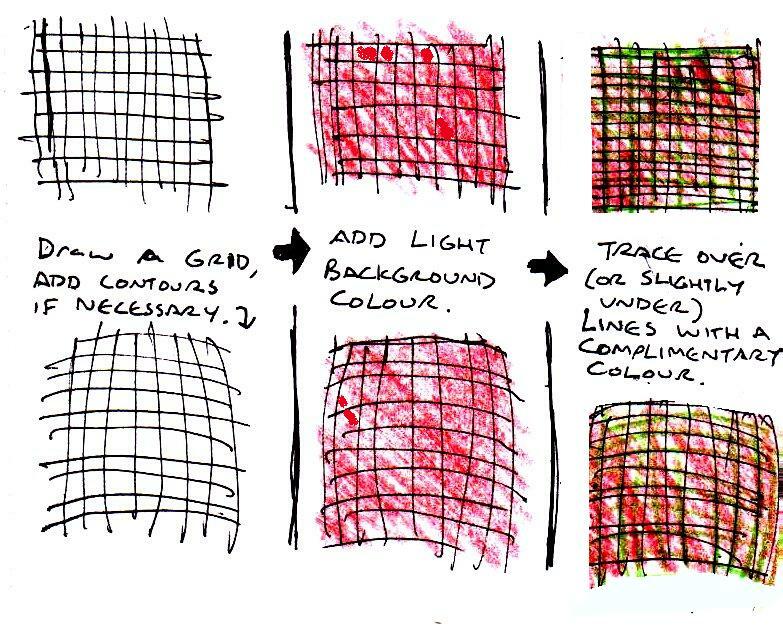 But, if you’re wondering how artists work out how to draw things they’ve never drawn before (without using guides), then here are a couple of basic skills that can be incredibly useful. 1) 3D Shapes: Learning how to draw basic 3D shapes (cones, spheres, cubes etc..) is an essential skill if you want to learn how to draw anything. Keep playing with 3D shapes until you have an intuitive understanding of not only how to draw them, but also the “rules” that they follow (eg: whether they look right). Playing 3D computer games (especially ones with more basic/simplistic graphics) can also help to improve your understanding of how 3D shapes “work”. Once you are confident about drawing any type of 3D shape, then all you have to do is to break down whatever you want to draw into a series of 3D shapes. Of course, you’ll also have to have some experience with…. 2) Copying by sight: Copying pictures or photographs by sight (and not tracing them!) is an incredibly important thing to practice if you eventually want to be able to draw literally anything. This is a skill that can only be learnt through sheer repetitive practice (and, yes, your early attempts at it probably won’t look great. But, they’ll get better if you keep going). The trick to copying by sight is to focus on drawing the outlines of everything as accurately as possible. Since a photo is a 2D representation of a 3D scene, the precise outlines of everything will look different to what you might expect them to. Just try to re-create them as accurately as possible, until you start to get an idea of the “rules” that this conversion from 3D to 2D follows. To show you what I mean, here is an example of the outlines of two humpback whales in a copyright-free US Government photo from Wikimedia Commons. For the sake of time, I had to *cringe* trace parts of the whales but, as I’ll explain later, there are important reasons why you shouldn’t do this when you’re learning how to draw! The reason why I was so adament about not tracing (when you are learning) is because copying things by sight forces you to think about what you are drawing. It slowly and subtly teaches you how to work out how to draw things on your own. 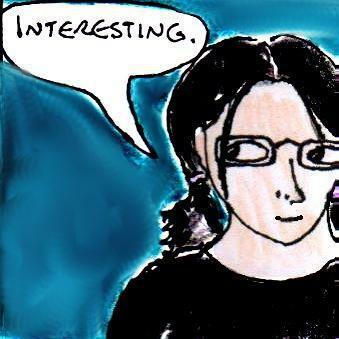 It quite literally forces you to re-create the things you are looking at, in a way that quick, lazy tracing doesn’t. It teaches you how to convert 3D objects into 2D drawings. Best of all, it also teaches you how to draw from life too. Once you’re used to seeing how 3D objects are represented in 2D photographs, you’ll be able to “look” at things in real life in the same kind of way. This is a bit difficult to describe, but you’ll know what I’m talking about when you experience it for the first time. But, of course, you can’t just copy other people’s photos if you want to make original artwork (it’s fine for private practice, but it’s plagiarism if you try to pass it off as your own work!). However, once you are mildly to moderately skilled at copying from sight, you can take a look at a few different reference photos of anything and, without even having to sketch them first (since you’ll already know how you would draw them from sight) – come up with your own unique drawing of whatever it is you want to draw. Well, I’d planned to make another instructional article like this one about drawing 1990s fashions, but I couldn’t decide which decade to focus on. So, instead, I thought that I’d talk about how to learn how to draw fashions from any decade (of the 20th century). 1) The Basics: Take look at this simplified chart (which I made in MS Paint in about 10-15 minutes) that shows you the basic shapes of many common types of clothing. Most vintage clothing from the 20th century will usually be a variation on one or more of these things. There wasn’t enough room for hats, but these old drawing guides (here and here ) might come in handy if you want to draw hats too. [CLICK FOR LARGER IMAGE]. Here are the basic shapes of a lot of elements of 20th century clothing, but thinking about it, the sleeves on the shirts should probably be slightly longer. Remember, most types of clothes that you want to draw will just be a variation of one or two of the things in the chart. Likewise, if you want to learn how to draw slightly more realistic clothes, then this old article might come in handy, as well as any other guides that you can probably find online with a quick search. 2) Look at lots of pictures: Firstly, open a search engine and do an image search for either a decade’s fashions as a whole, or a specific fashion (eg: “1990s fashions” or “1980s power suit”). The trick here isn’t to mindlessly copy one particular picture (depending on how detailed/specific the design is, it might even be considered plagiarism to do this) but to look at as many different pictures of a general type of fashion or clothing as possible until you have an understanding of how it “works”. Once you’ve done this, you should then be able to come up with original and/or generic designs based on the general facts that you’ve learnt from looking at lots of different pictures of the same type of fashion. Either that, or if a generic type of clothing was popular in a particular decade, then work out how to draw it by experimenting with altering the outlines in the chart above. This is a reduced-size preview of a painting that will appear here in mid-late April. As you can see, I’ve used a fairly gloomy and muted colour palette, which is contrasted with parts of the background. So, yes, learning a lot about the general features of a particular type of clothing and/or historical fashion can help you to work out how to create new examples of it in your own art. Well, for today, I thought that I’d talk very briefly about a simple traditional drawing technique that I discovered when making one of the paintings that will be posted here later this month. This was one of those times when I was making the preliminary sketch for a painting and suddenly thought “wouldn’t it be interesting if I tried this?” Only to later discover a new drawing or painting technique. But, I was curious about whether a similar technique can be achieved through traditional means. It can, but the technique I used is a lot more subtle and a lot less instantly noticeable than simply blurring/ smudging the background digitally. 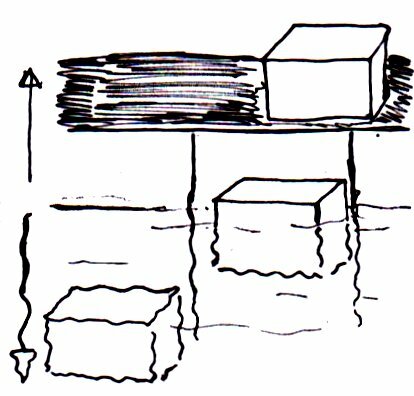 In fact, it’s very similar to the technique that most artists use when drawing objects that have been submerged in water. In other words, all you have to do is to make all of the lines in your drawing slightly wavy. After you’ve done this, then all you need to do is to add the usual thin diagonal lines in order to signify that it’s raining. 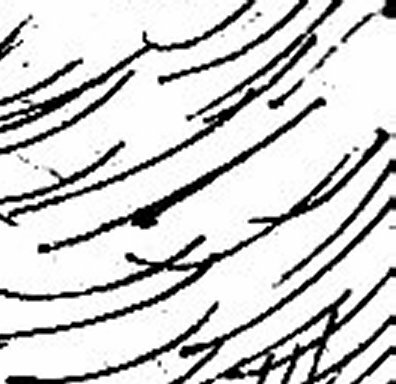 However, unlike when underwater objects, you want to make the wavy lines a lot more subtle. In other words, just make the lines slightly wavy rather than very wavy. Here’s a quick chart that I knocked up in MS Paint to show you what I mean. [CLICK FOR LARGER IMAGE] As you can see, the lines need to be slightly less wavy than those used for drawing underwater objects. In addition to this, it might also be worth using techniques similar to those used for drawing and/or painting foggy landscapes. Namely that the further away from the foreground something is, the lighter and blurrier it should be. I forgot to use these techniques when I was experimenting with drawing rainy windows, but I can see how it might be useful. This is a detail from an upcoming painting. Notice how the edges of the brown building are wavy/blurry, in order to simulate rain on the window in front of it. As I said, I didn’t use any “fog” techniques in this painting and the “rainy window” effect is also not really as noticeable as it would be if I’d used digital blurring techniques instead. But, it was still an interesting learning experience and it might be something that is worth experimenting with if you’re making traditional art. Well, although I’d planned to write a proper article (about fascinations and creativity) for today, it didn’t really work out that well and I eventually ended up abandoning it. So, instead, I thought that I’d make a few drawing guides for today that are based on one of my current fascinations- I am, of course, talking about 1990s fashions. Regular readers of this blog might notice that these guides bear a slight resemblance to my old “How To Draw” guides from mid 2013-early 2014. Although I have no plans to re-start this as a regular series, it was kind of interesting to return to it again, albeit briefly. 1) Dark Floral Patterns: Although I vaguely remember this being more of a formal fashion, it was also apparently quite a popular grunge fashion in the 1990s too. I am, of course, talking about clothing with dark floral patterns. Not only can this style be both formal and informal and both conservative and edgy, but it’s also simultaneously modern and timeless too. 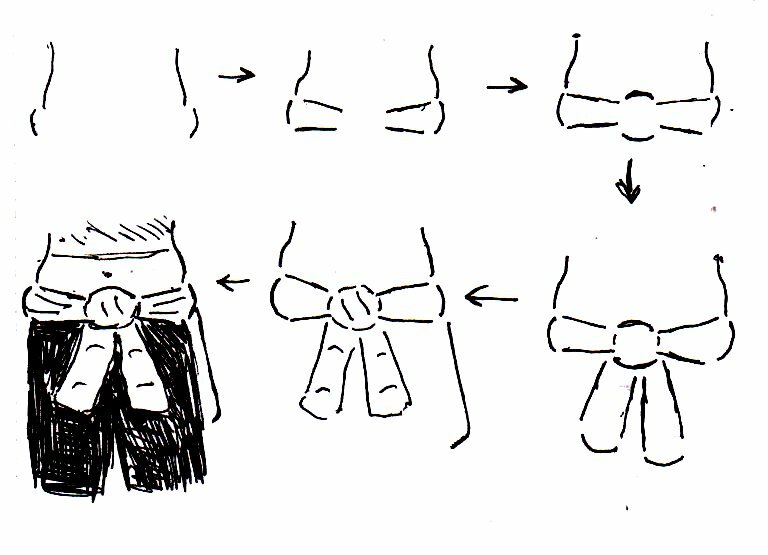 2) Sweatshirt Belts: Although I was still doing this as late as 2008 or 2009, the whole idea of wearing your sweatshirt or jacket as a belt seems to have been invented back in the 1990s. This also seems to be one of those “everyday” 1990s fashions that is incredibly forgettable until you read about it somewhere. 3) 1990s shades: Back in the 1990s, sunglasses were a lot chunkier and more plasticky – and, yet, they still seemed like they were a lot cooler than most modern types of sunglasses are. 4) Plaid: Back in the 1990s, plaid patterns (like floral patterns) were another thing that seemed to be fairly universal. On the one hand, they were part of the no-nonsense aesthetic of grunge fashion, but they were also a pretty major part of the much posher aesthetic of American “prep” fashion. Hell, even these days, plaid clothing is currently part of hipster fashion. Yes, I messed up this drawing guide. But, in theory it should work – although it might be an idea to do the third step BEFORE the second one. 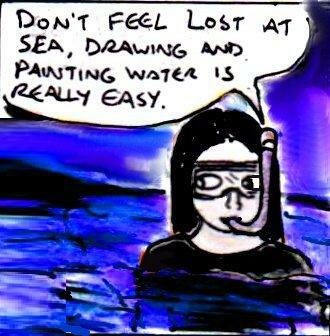 If you’re new to making art, then trying to work out how to draw and/or paint realistic-looking water can be somewhat confusing. Although I’m still learning the finer points of how to draw and paint realistic water myself, I’ve learnt a few things over the past three years or so which might come in handy. 1) The colour of water: This sounds like a fairly simple thing. After all water is supposed to be blue – right? Wrong. Water is, as you probably know, completely transparent and colourless. 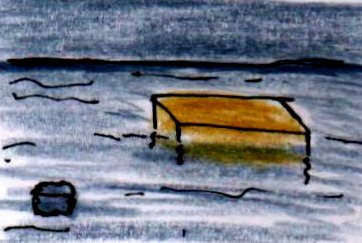 What this means is that the water in your painting or drawing should be approximately the same colour as the things above it and/or whatever it is being contained in. 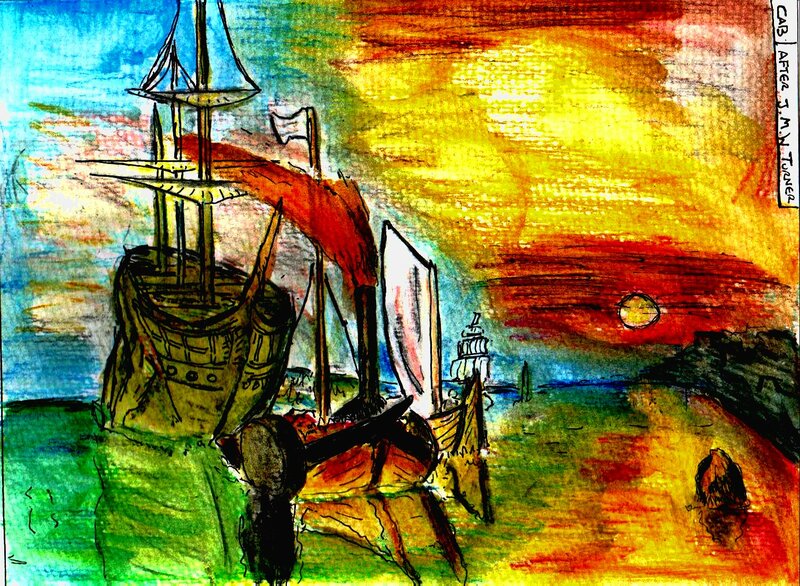 So, for example, if you’re painting the sea – then it should be roughly the same colour as the sky in your painting. If you’re painting the sea during the day, then this means that it should be blue/green. If you’re painting the sea during the sunset, then it should be orange/red/yellow/black and, if you’re painting the sea at night, then your water should be black/dark blue/ purple. Making oceans, rives, lakes and seas a totally different colour to the sky is a beginners’ mistake and it’s one I’ve made more than a few times in my own art. But it can be easily avoided if you remember this simple rule. Likewise, if – for example- you’re painting a red bucket full of water, then the water should be a slightly lighter shade of red than the bucket – perhaps mixed with a small amount of whatever colour the things above the bucket are. 2) Distortions: Because light passes through water at a slower rate than it does through air, everything underwater will appear slightly distorted. This is basic secondary school science, so how is it relevant to us as artists? Whilst you can use distortions alone to show the presence of water, it can sometimes also be useful to draw a few wavy horizontal lines on the surface of the water (like in the example) to make it clear to your audience that they’re looking at water. As you can see, the object that is deep underwater is a much darker shade of the water’s colour. 3) Very basic reflections of the sun and/or moon: I can’t really offer any advanced tips about how to draw and/or paint realistic reflections in water, because I’m still learning how to do this. 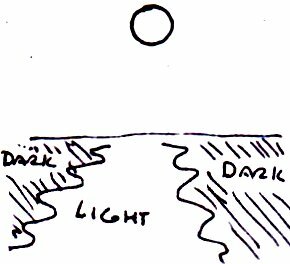 However, I can teach you one basic thing that will come in handy if you’re drawing the sea during the day and/or night. 4) Slightly realistic rain: Rain is fairly easy to draw, right? 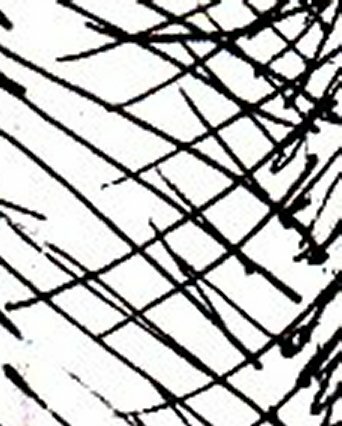 All you need to draw is lots of short diagonal lines across your painting or drawing and it looks like it’s raining, right? Well, yes. But, if you do this, then it will just look like there’s a very unrealistic two-dimentional sheet of rain falling in front of your picture. If you want to make your rain look more realistic and three-dimensional, then you have to make some of the lines longer and thicker (so that they look like they’re closer to the front of the picture) and some of the lines shorter and thinner (so that they look like their further away). Notice how some of the lines are longer and thicker than the others. 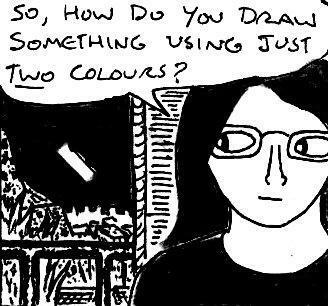 Although I’ve already written about why making art using just two colours (eg: black and white, without any grey) can be such a fun activity, I thought that I’d offer some more practical advice about the subject today. I should also point out that this article will be focusing on making traditional art rather than digital art, although some of the tips here might stil be useful if you’re working digitally. 1) Be prepared for a challenge: There’s something of a misconception that, because you’re not using anything other than black and white, monochrome art is an “easier” or “lazier” type of art to make. This couldn’t be further from the truth. In my experience, monochrome art is often far more challenging and time-consuming to produce than colour or greyscale artwork. Why? Because not only do you have to include more fine detail (or at least the illusion of it), but you also have to pay much more careful attention to things like line width, contrast, hatching etc… (which I’ll explain more about later in this article) too. Personally, I enjoy the added challenge that comes with making B&W art. But, I thought that I should warn you that it can be a much more difficult artform than you may have expected. 2) Black fill: Generally speaking, if you’re making B&W art, then there are probably going to be large areas of your picture that will need to be completely black (eg: shadows, night skies etc…). Whilst you can fill these areas in with the pen that you’re using, I wouldn’t recommend doing this for two reasons – the first is that, if you’re using a good-quality non-refillable pen, then it will waste a lot of ink. The second reason is that it’s very difficult and time-consuming to colour large black areas consistently if you’re just using a pen (since there will probably be gaps etc… unless you are extremely meticulous). The way that I handle large areas of solid black is to make most of my B&W art on (fairly cheap) watercolour paper and then fill in the black areas using a black watercolour pencil and a wet paintbrush. Professional artists usually do this with India ink and a fine paintbrush, but since I’ve already got watercolour pencils – I use those instead. Another very useful technique I use to avoid mistakes when using black paint is to draw a solid black 3-5mm border around any areas I plan to fill. Since even the finest paintbrush isn’t as precise or accurate as a pen, making a black border ensures that I don’t accidentally get black paint on any areas of the picture where it shouldn’t be. 3) Hatching and line width: Although you only have two colours to work with, your art doesn’t have to just consist of areas of solid colour. Although you can’t use grey in a B&W drawing, you can at least create the illusion of shaded areas by using a couple of simple techniques such as using lots of small dots, hatching and/or cross hatching. A series of curved hatched lines – notice how almost all of them are pointing in the same direction. The area on the right of this picture is cross hatched. Finally, another thing that you should use to your advantage is line width. If you need something in your picture to stand out or look closer to the foreground, then make sure that all of the important lines in it (or at least just the outline) are wider than the lines you use in the rest of your picture. 4) Contrast: One of the things that you need to pay constant attention to when you’re making a black & white drawing is contrast. In other words, each separate part of the picture should ideally be at least a slightly different shade or colour to the areas next to it. This is because, if most of the picture is exactly the same shade or colour, then everything can “blend” into each other and look like a confusing mess. Making sure that each part of the picture is a slightly different shade to the parts next to it can help you to avoid this. Likewise, you also need to look at your picture as a whole and make sure that there is a good balance of lighter and darker areas in it. This is because, even if you use subtly different shading for every part of your picture – if your entire picture looks too light or too dark, then it can still be confusing and visually unappealing when viewed at a distance. 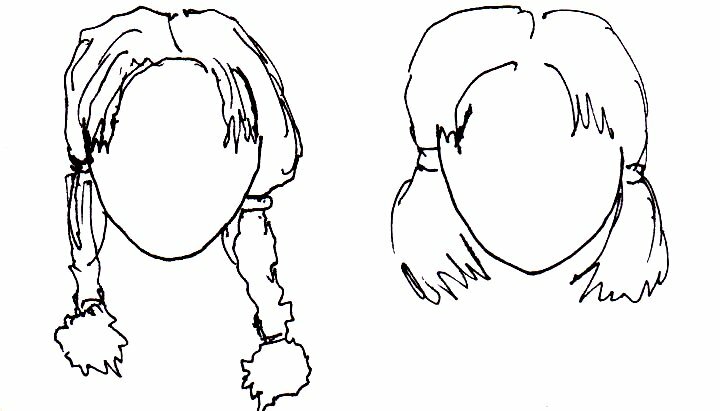 Whilst this guide won’t teach you how to draw any specific hairstyle, it’ll give you a few basic pointers about drawing hairstyles in general. 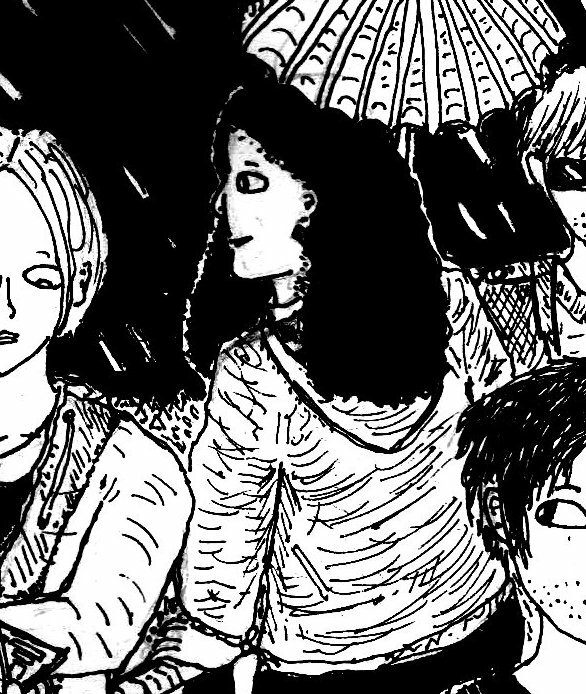 This article is aimed at people who are either completely or fairly new to drawing, so I apologise in advance if it sounds like I’m “stating the obvious” in some parts of this article. The first thing to know is how to draw a basic head – it should be oval shaped and, if drawn in profile, the front should initally be slightly flat (although you should obviously add contours and details later). Obviously, you should draw it in pencil. But, for clarity, I’ve drawn it in pen here. Once you’ve sketched this in pencil, then you can add a hairstyle to it before adding all of the other details and going over it in pen. Well, the first thing to do is to learn how to draw a few basic existing hairstyles. And, like learning how to draw anything, this will involve copying. The first thing to remember is that, whilst drawings and photos of hairstyles can be copyrighted, the hairstyles themselves cannot (disclaimer – I am not a lawyer and nothing in this article should be construed as legal advice). What this means is that you can use lots of reference photos of the same type of hairstyle to learn how to draw it, but (apart from when you’re practicing) you can’t just copy one photo. And, when you’re practicing, you should always copy photos rather than other drawings. 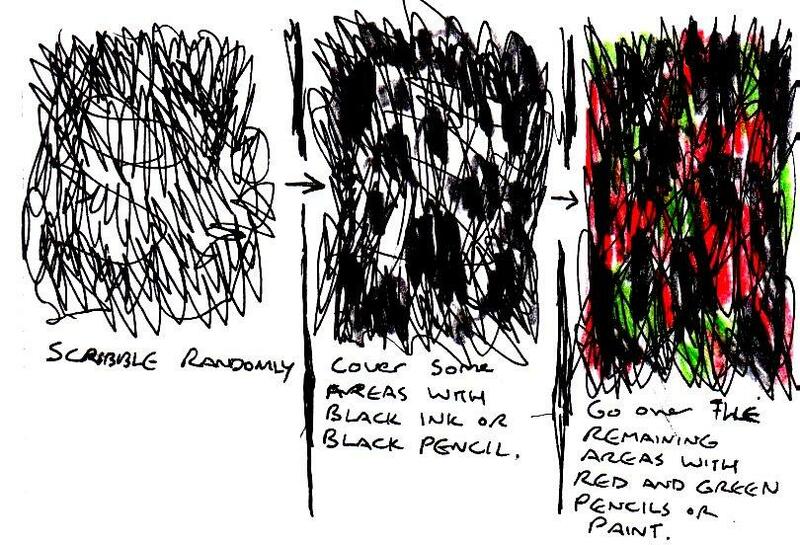 The main reason for this is that your copy is more likely to be unique and realistic if you practice by copying photos than it is if you bypass this transformative step and try to practice by copying drawings someone else has made. Not only that, it’s more likely to count as “fair use” under the copyright laws of your country if you practice by copying a hairstyle from a photo rather than copying one from something in the same art medium as the one you’re using. Anyway, how do you copy a hairstyle from a photo? As I’ve said before in other articles, it’s always important to remember that a photograph (like a drawing) is actually a two-dimensional representation of a three-dimensional image. As such, the exact outline of a hairstyle will probably look slightly different to what you might expect it to if you’ve never copied a photo by sight before. So, although you should always learn how to copy by sight alone (it’s one of the most important skills that any artist can learn) if you’re just starting out, then it’s ok to trace a few pictures of people’s hair [either traditionally or in a digital editing program] just to learn what I mean about the outlines of hairstyles in photos looking different to what you might expect them to. Once you’ve got your outline, then all you have to do is to add a few thin lines flowing in the right direction in order to signify the individual strands of hair. I can’t emphasise this enough, but you do NOT have to draw literally every strand of hair, just add a few thin lines and your audience’s imaginations will “fill in the gaps”. Ok, but how do you create new hairstyles? Anyway, once you’ve done a lot of copying and have a good knowledge of how to draw several basic hairstyles (a good test of this is whether you can draw these styles purely from memory without looking at anything), then try mixing them together in new and interesting ways. Try adding parts of one hairstyle to another hairstyle, try changing the colours of parts of the hairstyle, try making parts of it longer or shorter, try making it look more or less neat etc… I’m sure you get the idea. And, well, that’s about all there is to it really. This is how you draw new and interesting hairstyles.